– A good friend of mine when I told him that I was going to volunteer for Sundance London. I’m an avid fan of Sundance Film Festival in Park City, Utah. To me, the line-up announcement is more exciting than Christmas and for ten days in January, the incoming film reviews become the equivalent of my morning newspaper. I read up on interesting new filmmakers and keep my eyes peeled for the titles that make it over to the UK. 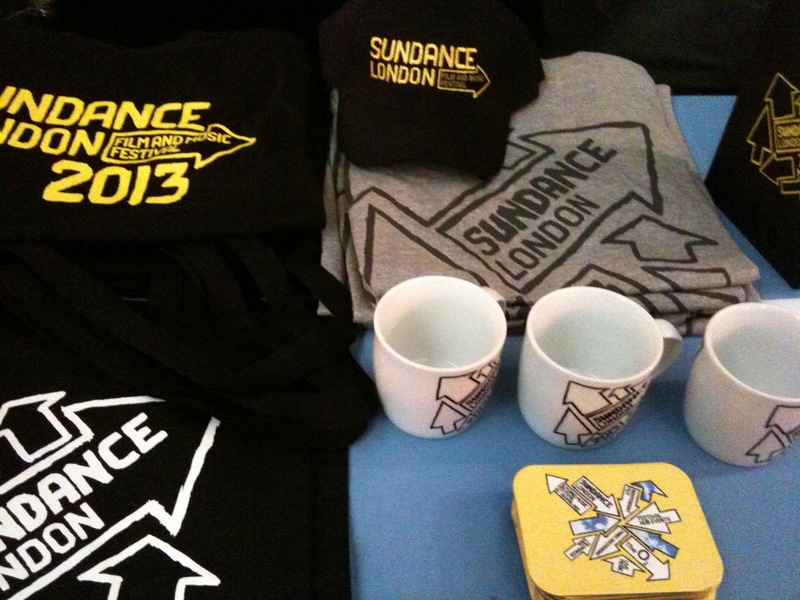 So when Sundance announced an additional festival in London last year, I had to go. As expected, it fuelled my addiction and by the end, I didn’t want to leave. But what I didn’t expect was the army of volunteers on hand to guide me through it. 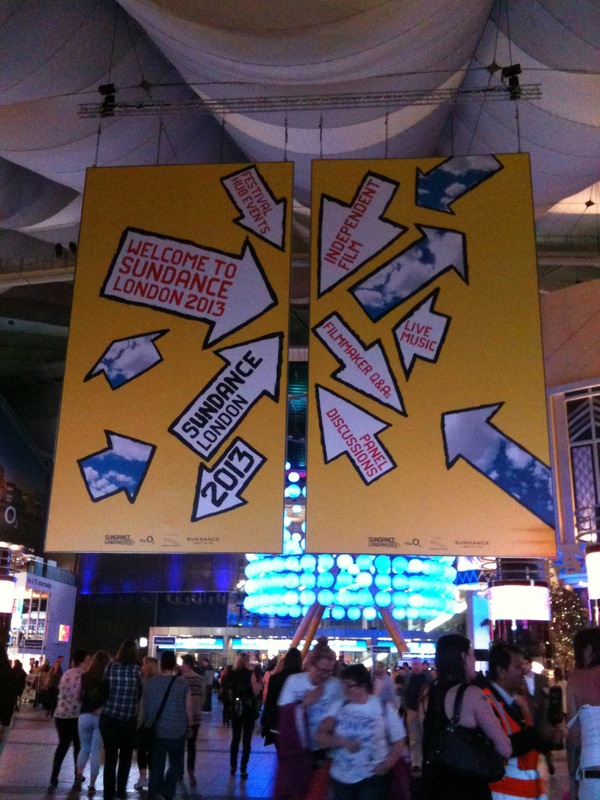 I hadn’t given much thought as to how a festival of this size would operate and I was intrigued, so as soon as Sundance London 2013 was confirmed, I put my name forward to volunteer. A few days before the festival starts, we’re called in for training. So on a freakishly sunny London afternoon, I head out to the O2 in North Greenwich. After a quick check-in to collect my festival credentials and yellow hoodie, I join 100 or so other volunteers in Cineworld 10. There are a mix of ages and it appears to be fairly evenly split male / female. When I take my seat, I immediately start to hear a lot of American accents and it turns out that some people who volunteer for the festival in Utah have come to London do the same (I hope they see more of London than the O2, as I’m not sure it’s very representative!). There are also lots of Brits who volunteered last year – a good sign. The training comes in three parts – Sundance, The O2 and Volunteers. It’s very thorough and some interesting facts come up. I find out that The Sundance Group comprises of seven entities, not just the Institute and the festival, but also the Sundance Channel, a small cinema chain and a ski resort. I’m also surprised to learn that The O2 has its own emergency services and that if you want, you can walk on the roof (I don’t think these facts are related). We also get to learn some useful festival acronyms and key terms. My favourite is ‘a left turn’. This is someone who appears to be completely normal at first, but then goes berserk when Robert Redford turns up. I look around me and try to guess who that might be. Finally, we are warned that Pink is playing over the weekend and the 16,000 capacity arena is expected to sell out. This terrifies me more than anything else I’ve heard all night. We are then split into smaller groups and given a walking tour of the O2. The promoter wants to make sure that we are prepared for a wide range of questions from the general public, including directions to arena entrances, cash points, toilets etc. We become familiar with the Bubble, the Hub, Entertainment Avenue and the ‘tent’. On the first day, I underestimate the public transport to the O2 and turn up 20 minutes early. The place is spookily empty and as I wait for Security to open the volunteer centre, I watch one of the cleaners crawl along on her hands and knees, expertly scraping chewing gum off the floor, while simultaneously having an animated loudspeaker conversation on her phone. It looks tough and I secretly hope that I don’t have to do that. The volunteers are based in a vast open plan room with high ceilings and black walls. It resembles an underground bunker and makes me think of Dr Strangelove, although it’s more B&Q than Ken Adam. But the coffee is free, it’s quiet and there are plenty of places to rest. Due to my early arrival, I get to sit through a brisk production meeting. Heads of department update the room, concerns are raised and quickly resolved. It’s a slick operation and everybody seems to know exactly what they’re doing. The problems are fairly typical – minor logistical issues, multiple ticket requests, an AWOL guest. Once the meeting is over, the managers grab walkie-talkies and everyone gets started. 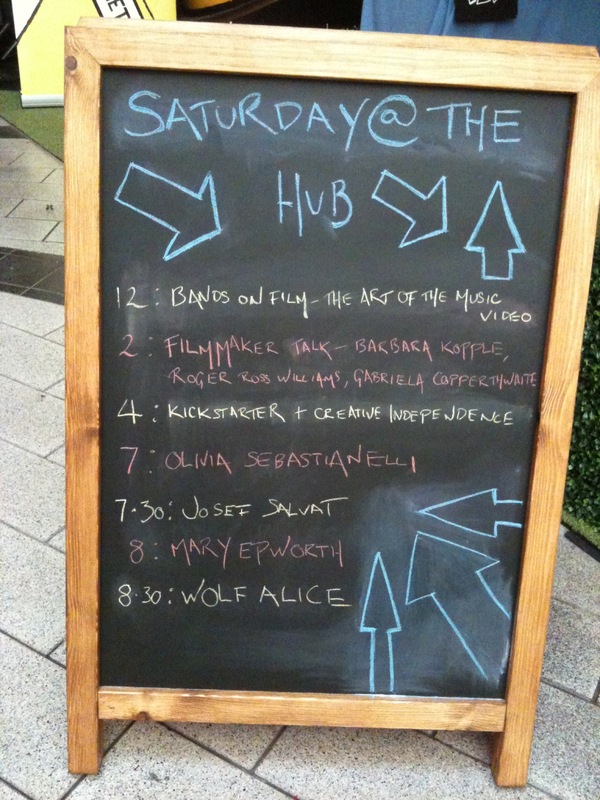 Today’s job is to help set up the festival hub – a central venue for several filmmaker talks and band performances. But first I have to stop off at the Filmmakers’ Lounge to collect some equipment. Hosted by Jaguar, this is a luxurious 2nd floor bar with comfy chesterfield sofas and armchairs. Gold records, guitars, rare music posters and photographs cover the walls. A large TV is set up to loop a short film from Ridley Scott Associates called ‘Desire’, a promotional drama for the new F-Type. I wish I could stay all day – Damien Lewis on repeat! – but unfortunately I can’t, so I head back to the Hub with a box of fairy lights and some double sided sticky tape. I finish around 4.30pm and head off to see a couple of films. Although I’m no long wearing the hoodie, I can’t help looking out for and acknowledging other volunteers. I leave just after 10.30pm and find myself in a speed walking race with some of the Pink fans, who are cunningly trying to escape the tube station crush by leaving early. I actually start to jog – you lose, Pink fans! The next day is a little different. I’m checking-in guests for an invite-only party at a central London hotel. I arrive just before 5pm and meet up with my volunteer buddy by the front entrance. We gingerly approach one of the hotel staff and almost before we finish explaining, she says “Oh yes, Sundance, some of you are here already. Follow me”. She takes us down several flights of stairs to a basement room where we are introduced to a very nice PR lady and assorted Americans. There’s a lot of handshaking and I notice a lot of guitar cases stacked around the room – strange, I think, but I don’t question it. We ‘hoodie-up’ and start discussing the films we saw the previous night. Gradually, I become aware of the very nice PR lady hovering behind me. She makes small talk and then politely cuts to the chase, “Who are you and what are you doing here?”. And then we realize …we are in completely the wrong place and we’ve crashed a very private gathering. We quickly leave. I find out later that it was a band rehearsal for Gregg Allman (of The Allman Brothers Band, subject of the Muscle Shoals film and star guest at the O2 the following evening). How embarrassing, I still have occasional flashbacks (“Oh God, the man in the corner with the long hair was Jean Paul White of The Civil Wars!”). Luckily, the Sundance staff find it very funny. We eventually the ‘right’ place and get ready to work through an enormous 16 page guest list along with two other volunteers. It’s an impressive collection of names and I have to admit to feeling a little nervous – filmmakers, industry, the Sundance team and independent UK production companies and distributors make up the crowd. From about 7pm the arrivals are fairly steady and for about an hour, I barely get chance to look up. Gradually the room fills and voices drown out the background music. We start to flag and one of the waitresses thoughtfully smuggles out some food – mini burgers and fish and chips. The evening goes very quickly and the party (as far as I can tell) runs smoothly. As people start to leave, we count over 400 guests checked off on the guest list. Exhausted, we decide to finish the evening in the hotel bar and buy a (pricey) bottle of wine to celebrate. I don’t remember much of my journey home, but thankfully, I can sleep in the next morning. The next day is equally unpredictable. I arrive just before 2pm to catch one of the free talks in the festival Hub (three feature filmmakers who have all made ‘coming of age’ films). It’s a very intimate setting, the audience gets to ask lots of questions and the directors are very candid. I meet my line manager and find out that we are working at a party in the Jaguar Filmmakers Lounge. When we get there, the party is already in full swing. It’s loud and crowded and the DJ looks like he’s having more fun than anyone. But then there’s a change of plan and I get called to the cinema. The Theatre Team have multiple screenings, but are short on volunteers, so I head over to meet a new set of people and get a crash course in audience management. Although I originally decided to stay away from this side of the festival, I’m surprised by how much I enjoy it. Maybe I’m easily pleased, but I have a lot of fun ripping ticket stubs, talking to the audience and recording the data. By the end of the evening I’m ready to open my own cinema. The cinema area is dynamic and fast paced. Serious-faced Theatre Managers run past talking into headsets, Sundance programmers and filmmakers linger, while staff and volunteers do their best to fulfil the wait list. And they really go out of their way to fill seats – if you go, never be put off if a film is listed as ‘sold out’. Working with the Theatre Team is surprisingly tiring and my coffee consumption reaches new levels, but there is a healthy dose of stress and anxiety without being too overwhelming. Now that it’s all over and I’ve (almost) recovered, I’ve had time to reflect and it’s definitely an experience I would recommend and something I would do again in an instant. I can’t lie, it’s exhausting – I’ve been running on adrenaline and caffeine for the last few days, and now that I’m ‘coming down’ I realize just how tired I am. But the experience gave me a good overview of the festival roles and responsibilities. Apart from the Sundance team there is a core group of paid staff who are responsible and experienced. Some of them started as volunteers, so it’s potentially a way to get a foot in the door. Importantly, I had a lot of fun. I met like-minded people and made friends and contacts – extremely valuable if you are interested in film festivals or event management. And I surprised myself – I managed to survive in some stressful situations and I enjoyed things that I didn’t think I would. Additionally, as part of my volunteer benefits, I got to see four films for free and attended two talks in the Festival Hub. After what feels like several weeks of watching mediocre new release films, Sundance managed to show me a film that blew me away (Upstream Color) and I got to hear some hilarious Michael Shannon anecdotes from Jeff Nichols. I’m not really a big fan of Pink. Always, always, always separate your credit card receipts from your cinema tickets. It’s really annoying if you have to rip ticket stubs in a hurry. And I picked up a few tips on how to gatecrash a party – walk briskly, look straight ahead and don’t stop. NEVER MAKE EYE CONTACT. And hope that I’m not on the door to check you in, because thanks to Sundance, I have a very particular set of skills. I will look for you, I will find you and I will… have you thrown out. When not volunteering, Clare Dean can be found on twitter.